Hiring can be overwhelming, especially when you’re a solo-preneur. As you are growing your business, you will eventually hit a point where you have more opportunity than you can keep up with. When deciding whether or not you should bring on another staff member, there are a few things you should consider. 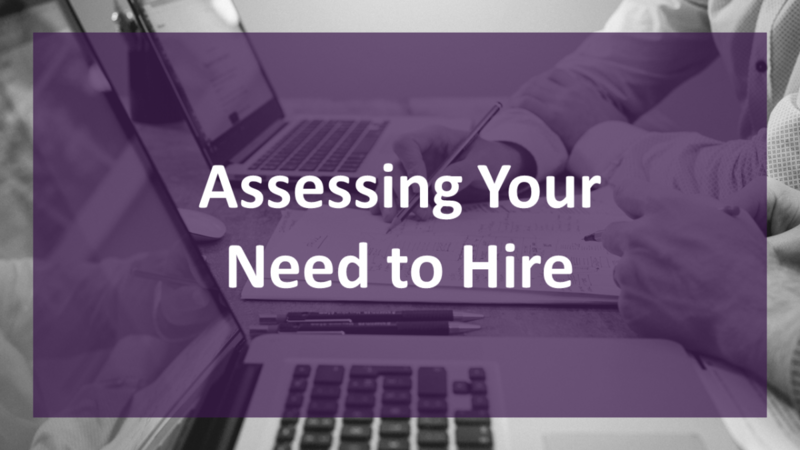 Can you increase capacity without a hire? When you’re overloaded, sometimes the most obvious option is to grow your team. While bringing on a partner in crime seems like an easy solution, it may not be the right time for your business to make that investment. For companies, new and old, who are unable to keep up with demand, it is important to understand the why? Think about why your current workflow is limiting you. What steps in your process are taking the most time? Are there opportunities to streamline the way you work to maximize value and efficiency? For instance, imagine you are a stationary designer who hand-stamps each envelope on behalf of your clients. This hand-stamping adds up over the course of a 500-count wedding invitation order! Your core value here is the beauty and quality of your design, right? So perhaps it may help you to purchase pre-stamped envelopes, or a machine that can print postage for you. Other opportunities for freeing up capacity can come from improved scheduling, automating manual processes, or re-prioritizing tasks. Whatever your biggest pain point, try to find a way to optimize it before you grow your staff. After you’ve improved the way you work, it becomes easier to assess whether you still need help. If your upgrades make it easier to handle the workload on your own, then you can hit pause before adding to your team. If the volume is still too much for you to manage, you now have a better understanding of the why and what behind your desire to hire. Through revamping your workflow, you will have assessed which ancillary functions take the most time away from your core duties that drive value in your business. Where Do You Still Need Help? Ask yourself, what are the tasks that I still need help with? How much of my time would be freed up to focus on high impact activities if someone else could do these activities for me? The answer to this question will help you decide whether a contract, part-time, or full-time hire is necessary. You will also want to consider whether those activities fluctuate seasonally, as there might be more work in certain parts of the year than others. Often, when entrepreneurs get to this point, they have mastered creating core value for their business, but they need support in other areas. New staff or contractors can spur growth and may come in the form of support in billing, scheduling, business development/sales, marketing, and/or operations. Do you currently have the expertise to sustain and grow? Teams of all sizes get to the point where the work is too much, from entrepreneurs moving on from the bootstrap stage, to small businesses looking to strengthen their core, or mature businesses defining new functions. In all of these cases, teams have had success up until a certain point. The work that needed to be done to date fell within their expertise and they could maintain their progress. However, with growth comes new challenges in the form of rapidly changing consumer preferences – demands for new products or services that may fall outside a business’s current expertise. So, what if these changes require you to expand your business’s capabilities in order to continue to create or grow value? If you are looking to broaden the type of work your company performs, a person with more specific and relevant experience may be a better fit. Before moving forward, it is important to understand if you can afford this new hire. A solid financial model is a great tool to determine whether you yourself should invest in training to learn a new skill set, whether you should hire, and how much you can pay an addition to the team. For instance, if you are a plastic straw company looking to upgrade to biodegradable materials, do you have the time and money to learn how to process the new materials yourself? Or does it make sense to bring on someone with that knowledge for immediate impact? How do you find the best fit? You’ve mapped out the core functions where you need help, determined how much work is available, and identified additional expertise that might be necessary for continued growth. So, what’s next? Determining the right fit: personality, education level, experience, and skills are key. Once you understand these components, you can frame them into a single story that will enable you to write an effective job description and attract the right candidate. Culture is one of the most important elements of the workplace and should be a top consideration during the hiring process. Although finding the right cultural fit can be more of a feeling than a fact, there are business tools that can help you identify an ideal personality type for a potential team member. A trepwise favorite, the Predictive Index compares a person’s self (how they think they are), their self-concept (how they think others expect them to behave), and a synthesis of the two (how they show up). It is an excellent tool on which to base a discussion around behaviors and attitudes. Checking a candidate’s social sites and contacting references can also help you get a stronger sense of their personality. In the end, tools can support your decision on the right fit for your business, but nothing can replace getting to know the candidate in person. Beyond finding the right cultural fit, challenge yourself to find a cultural add in your next hire. This is someone who offers aspirational characteristics to your business. You want to look for an addition who will go beyond going with the flow, someone who will help you build and strengthen your company through their thinking and challenge you to grow. You’ve determined your needs, set your hiring strategy, and drafted a job description. Now you’re ready to post. There are the traditional hiring sites, university career centers, and industry job boards, but we have found personal and professional networks the most useful in finding strong candidates with specific skills and experience. Looking for more guidance on next steps? Deciding whether to hire can be a difficult decision and is one of many that entrepreneurs have to make as they scale. If you’ve optimized your business processes and functions for efficiency and are still finding that you need support to meet the demands of your business, consider whether the need is full-time or part-time. Also, determine whether you are looking for an extension of your current operations or to acquire a new capability. This decision will drive your hiring objectives and plan going forward.